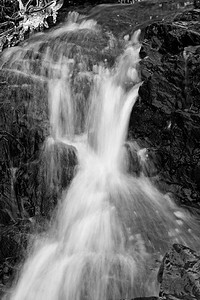 A mini waterfall along the road near Sawmill Camground in Lee Vining. 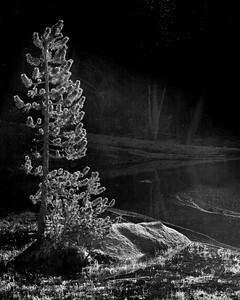 Finally photographed this tree that is growing up in the rocks below the upper Yosemite Falls. 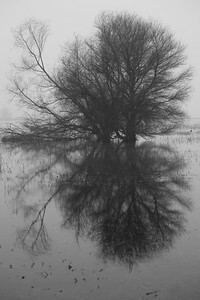 My first trip to the local refuge this year and it was quite foggy. 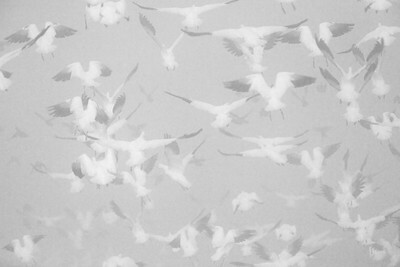 Had fun photographing some "abstract" work with a lot of geese in the fog. 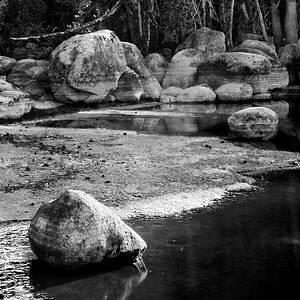 On my way home from Lone Pine, I stopped in at the Rock Creek Campground. It was near noon, so lighting was pretty harsh. I found a small pond with some wildflowers and composed a few pictures. 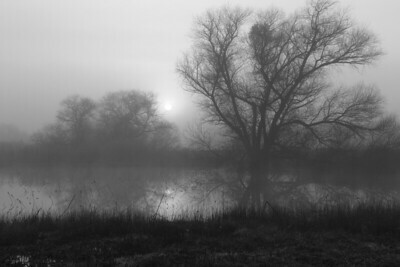 I got up early and drove out to the Merced Wildlife Refuge to see if I can get some early morning fog photos. I really liked the the isolation because of the fog. 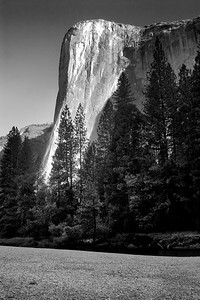 Somebody mentioned that this photograph looks similar to a pair of lungs, so that#&8217;s what I called it! 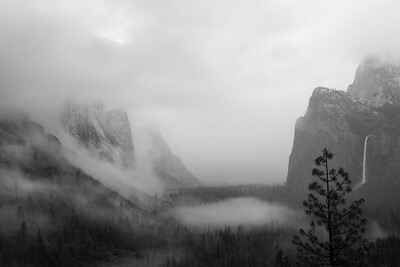 Had a chance to go up to Yosemite for an afternoon to meet another photographer. It was kind of hard to get out to take any “good” shots as the snow was deep and I don’t have snow tires on my wheelchair! 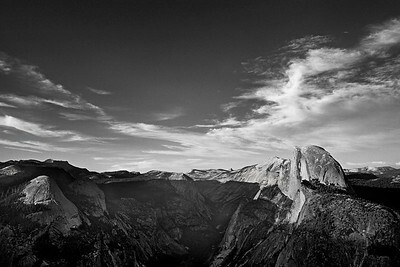 So we went up to Tunnel View and shot a few photos while I was there. 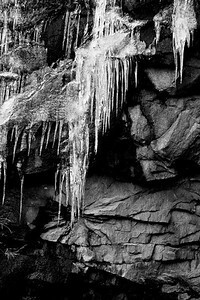 As we were leaving, my wife wanted me to take a snapshot of these icicles hanging from the rocks at the Wawona Tunnel. Thought it would look good as a black and white. 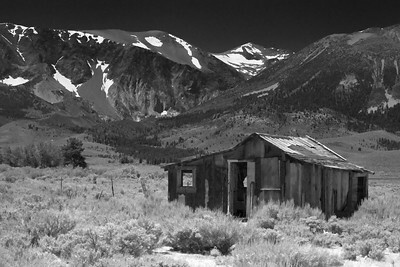 Anyone familiar with highway 395 near Lee Vining, should recognize this building. I’ve driven by many times in the past and never stopped to take any pictures. Since I had nothing else to do, I stopped this time and got this. 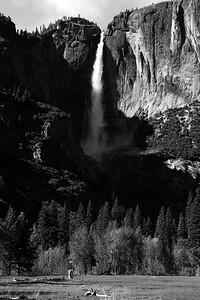 Converted it to a black and white. 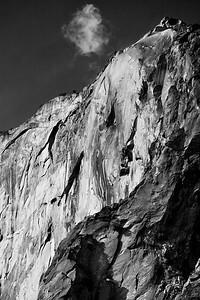 As I was waiting until sunset to capture the Horsetail Falls, I spotted this single cloud right on top of the falls. 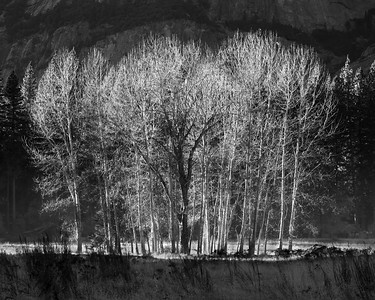 I thought I would convert the color image into black and white picture. 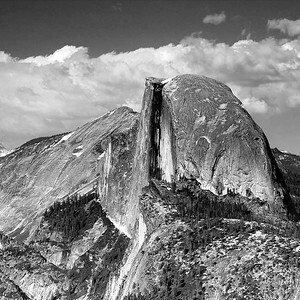 This was the last day that was able to go to Yosemite, June 6, 2006. A few days later I started getting complications from my knee replacement in February 2006. Right now I'm without a right knee, so these shots are memorable. I normally shoot from inside my car because I use a walker, but my friend saw a clump of bushes about 50 yards away that looked like a great place. The ground was pretty flat so I decided to venture beyond the car! 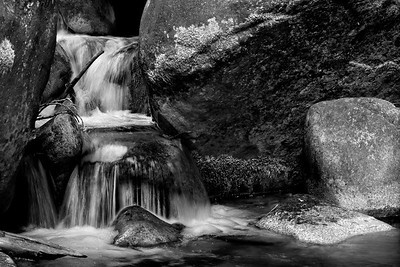 I moved as close to the stream as I could go, without falling in. The afternoon clouds were starting to form and the sun would go behind the clouds often. On this shot the clouds were behind the clouds. I really love this shot, but I would have preferred to see a bit more lighting on this shot. I have another shot on a “portrait” version that has that better light, but it was a great day regardless! At Olmstead Point the views were almost not existent. 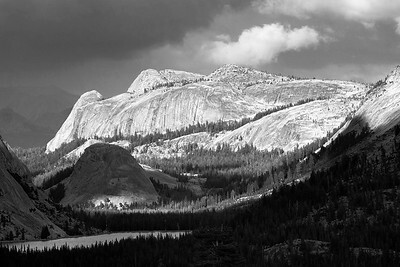 Clouds obscured Half Dome and Clouds Rest, but there was some great light right on top of and Tenaya Peak. 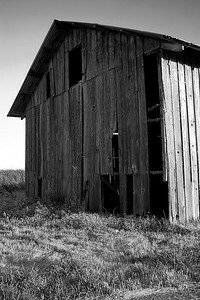 Since I was tired from walking with the walker all day, I decided to stay in the car and put the tripod right beside the car door and shot the last few photos and left for home. This was one of my hardest "hikes" I have ever done. I had to walk about 1/4 of a mile in my walker...carrying my camera bag and tripod. The clouds where a nice touch this afternoon! 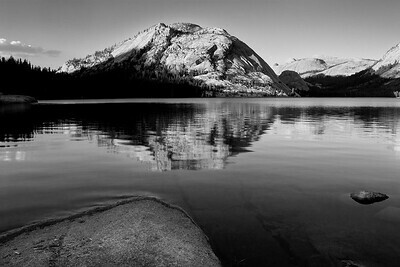 Decided to spend sunset at Tenaya Lake. Unfortunately the clouds never appeared, so sunset wasn't as spectacular as I had hoped, but it was always nice just to be out there! Just as it says...afterthoughts. I had been taking photos at Dana/Gibbs View for about an hour. As I was leaving I noticed the fallen tree beside the meadow, so I had to take a few photos! This is one of my favorite spots as it's also pretty handicapped accessible. 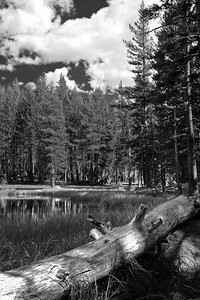 This is a small pond and Mount Gibbs is in the background. 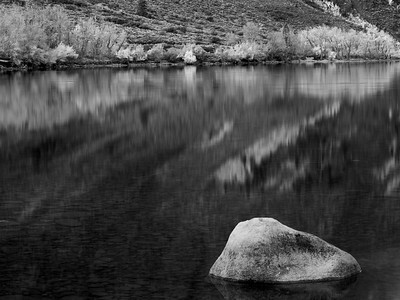 As I was waiting for sunset at Tenaya Lake, I noticed these boulders had some neat watermarks. In the springtime the boulders are almost underwater, but by August the water is much lower. 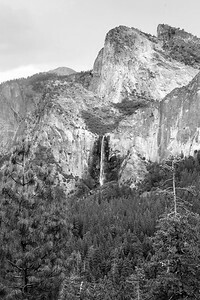 Just before an afternoon shower in Bridalveil Falls and Cathedral Rocks. 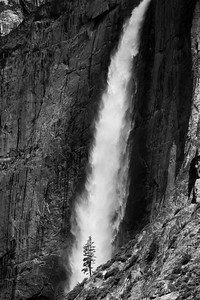 Yosemite Falls are full of water in the springtime. 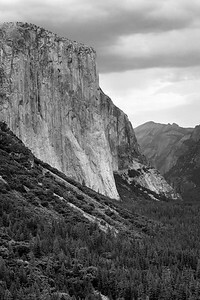 Couldn't resist a black and white photo of El Capitan from Tunnel View before I left Yosemite. 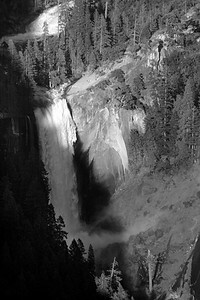 Vernal Falls From Glacier Point. 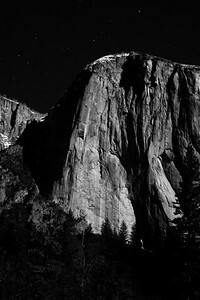 My wife and I decided to drive up to Yosemite for a few hours to get some night shots with the full moon. Since I couldn't walk, I put the tripod next to the driver's door. Well I was getting ready to shoot a Raccoon brushed against my leg and I jumped...I thought it must have been a Bear! 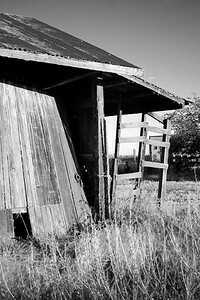 Just an old building near by San Luis NWR, California. 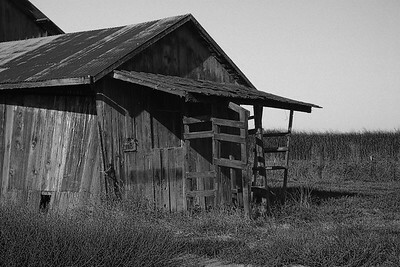 Just an old building near by the San Luis NWR, California. I was driving into work as I usually do, but I hapened to notice the fog was starting to roll in. 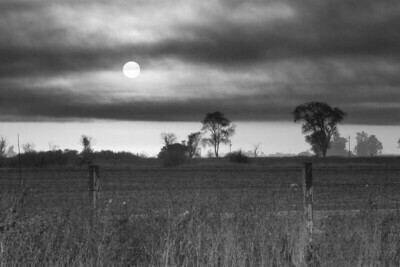 The sun was starting to rise also so I decided to shoot a few photos. I couldn't walk so I shot the photos from inside the car door. 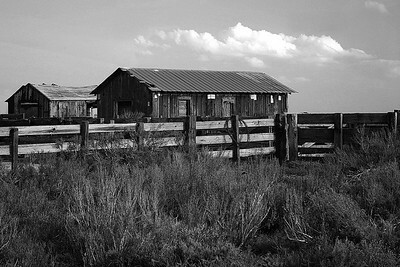 Merced, Ca. 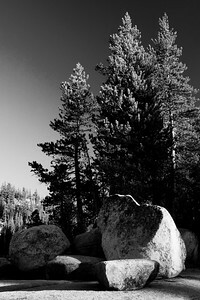 As I was watching the sunset at Tenaya Lake, I saw these and I figured I'd take a photo of them! 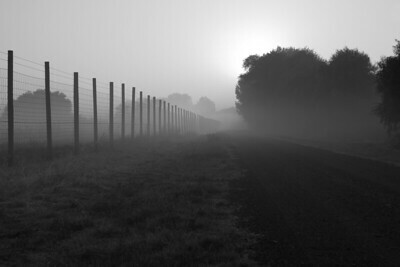 Had some fog at sunrise that morning, so I rolled down the window and took a few photos. I had to walk 1/4 of a mile, in my walker so I could see the sunrise at Cathedral Beach. The sunrise wasn't as great as I hoped, but there's always next week! The weather was pretty bad on this day. Luckily the weather cooperated for a few minutes and got a few shots. I couldn't walk very good, so a friend of mine moved the truck so I could shoot this shot from inside the truck. Since my family didn’t want to stay in the park while I took photos at sunset (and beyond), I dropped them off at the motel in Lee Vining, ate dinner, and drove back to the park. 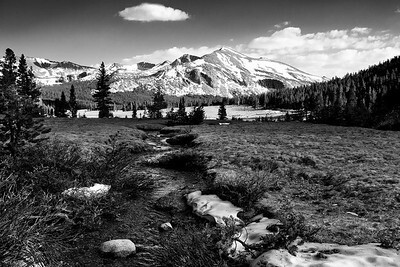 I decided to stay just shy of Tioga Pass, right here at Tioga Lake. I thought about walking (climbing) down to the shore, but decided I’d stay up here at the vista – much safer for me! 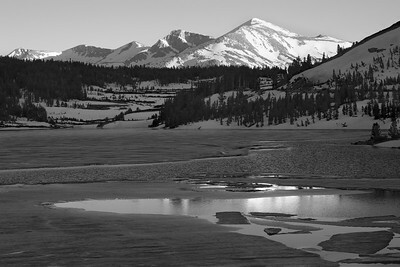 By the time I arrived (7:15pm), the light was focused on Mammoth Peak, so that’s pretty much what I did too. 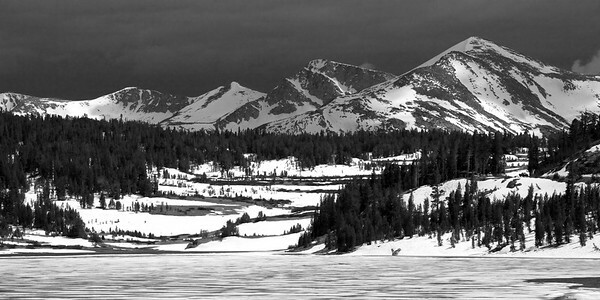 I did take a few pictures of the Kuna Crest and converted this image to a black and white. We like to take the kids out to Hornitos, CA every couple of months. It's a nice little town and the kids like to play in the playground. 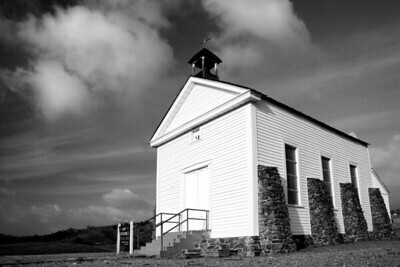 I told my wife that I didn't plan on taking any pictures of the church, unless I saw something unusual. Well, right before we left, some clouds started forming so I had to drive up the hill hand capture it! Well, maybe it's not really wintertime, but it does look like it. 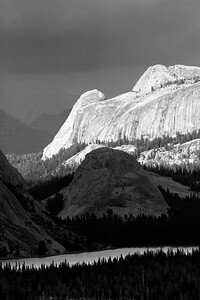 This was taken a week after Tioga Pass opened. I had to get there before the snow melted. 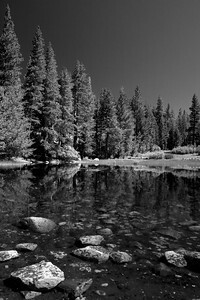 Having just hiked down to Tioga Lake, I was too tired to walk down to this part of the shore, so I shot this from the road. 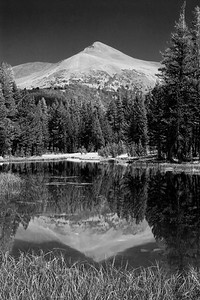 From the left you can see Parker Peak, Mount Lewis, Mount Gibbs and Mount Dana.